The wide range of projects carried out by PEB E&C encompassing a variety of different applications has also provided the basis to allow PEB E&C to draw on this experience and expertise to undertake projects of a special nature. In line with legislation to reduce gas emissions the Dutch government decreed some years ago that it was no longer allowed to vent (natural) gas to atmosphere which in the past was common when interventions (maintenance/repairs) in the pipeline network took place. 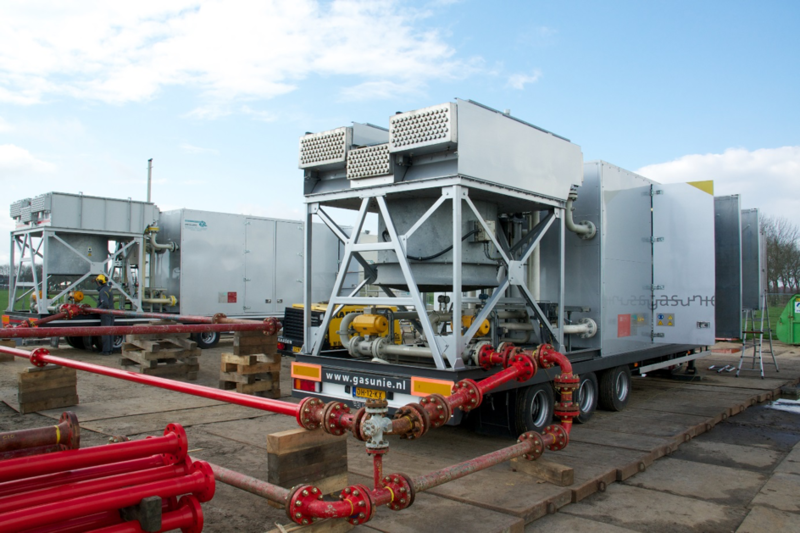 PEB E&C were tasked to provide a design for a 100% self-contained mobile compressor installation fitted to a standard road trailer which could travel throughout the Netherlands without special permits being required. The design would allow continuous automatic operation for transferring inventory from one pipeline to another without site personnel. PEB E&C has since provided a 2nd unit (pictured operating in tandem). This system is a good example of the capabilities PEB E&C have to offer in finding less conventional solutions to any given set of operating, logistical or legislative constraints.